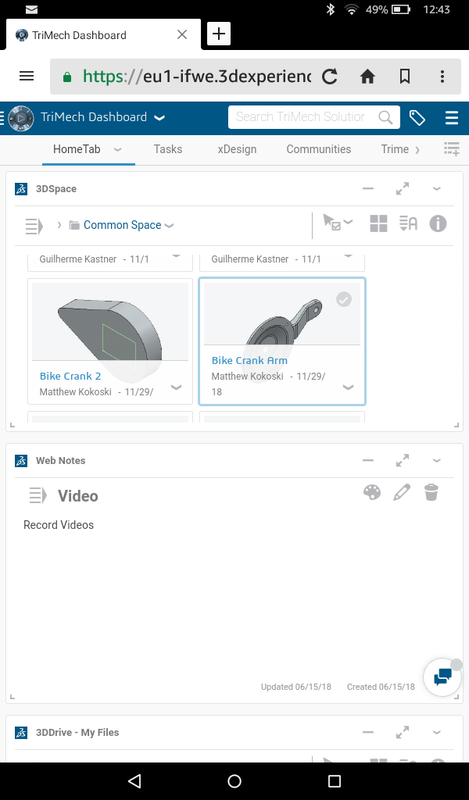 The first reason it’s beneficial to move 3D CAD to the cloud is communication. At this point, we’ve been interacting on the cloud for decades, so much so that the upcoming generation has come to expect it, and more importantly, expects quick responses enabled by the cloud. For better or worse, our response time expectation has shortened dramatically over the last 20 years and products need to move from concept to reality faster than ever before. While the cloud is partially responsible for this, it also provides a great solution. 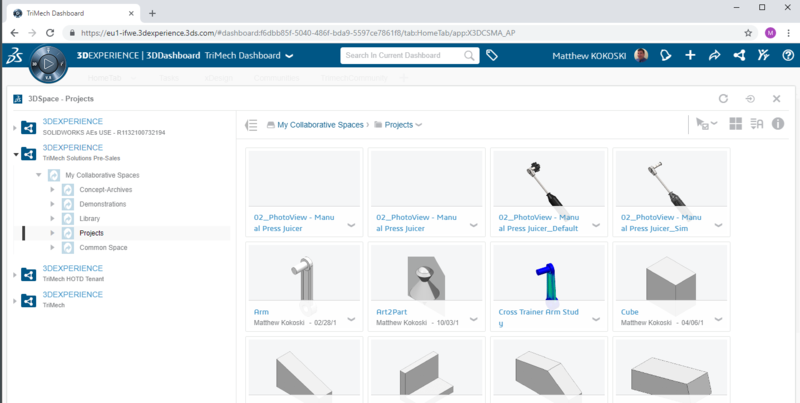 The 3DEXPERIENCE Platform provides design communities with the opportunity to communicate in ways they need. Think of it as a project book on a webpage; designers can instant message each other, store their specs and post ideas, questions and answers in one location where everyone can participate. Forget trying to print out the dreaded “Reply All” email string because the platform has the conversation organized and stored for all to see. The second reason the cloud can be beneficial is data storage. However, this is a double-edged sword. It provides a world of benefits, but there is also a sense of fear because we’re unsure where the data resides. The information is out there somewhere and we don’t know what machine it's on, where the machine is, who is backing up the machine and what we would do if something went wrong. In order to adopt designs in the cloud, we have to give up one thing that is difficult for us to relinquish, control. Once we move beyond the fear of cloud storage, we can start to embrace the vast number of benefits. First, we are not manually backing up the data, it's automatically backed up in the cloud. Having all that information stored away, where we don’t have to worry about backing up the server or testing the backup, is monumental. Second, the data is now accessible to everyone, in near real-time. 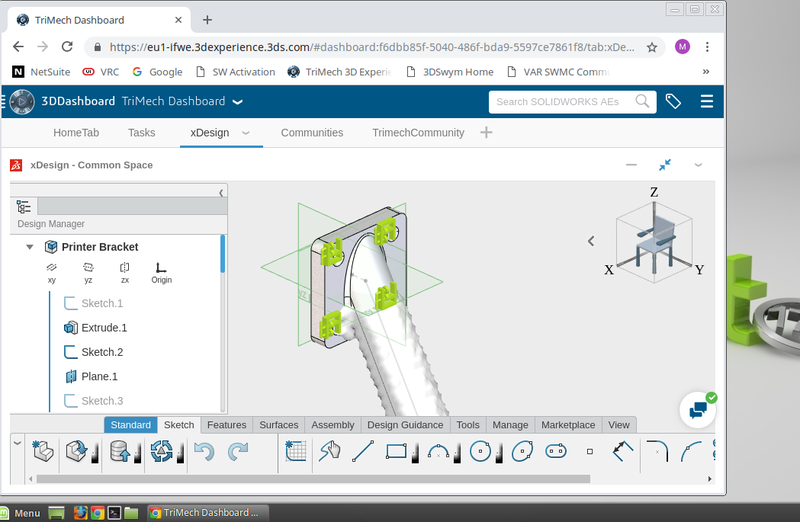 In SOLIDWORKS xDesign, I can create a file, and in mere seconds it is accessible to my teammates across the country. 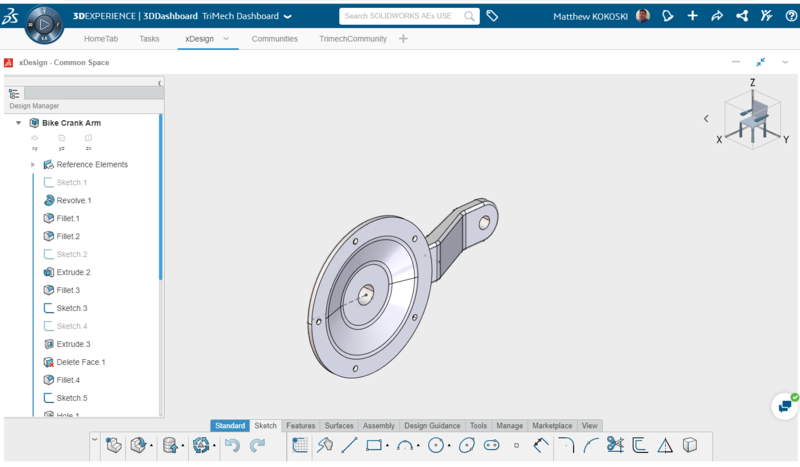 Reason three to move 3D CAD to the cloud is platform independence. When you're bored and you've run out of just about anything else to do, type random words into Google and see how it finishes with autocomplete. When I type “Does SOLIDWORKS” the first thing that appears is “run on a Mac.” I’ve heard this get asked more times than I can remember (and not just from half written Google searches). All my designs done in xDesign are platform independent. I’m running a Linux desktop at home, and I can design on that machine, but my Windows 10 laptop and Windows 7 desktop at work and even my Raspberry Pi are available for design work. Machine turnover is always an issue. 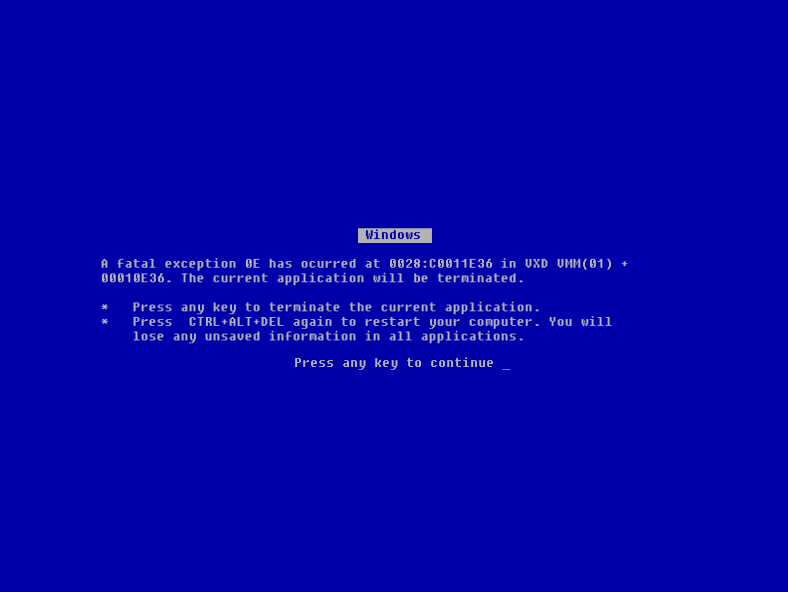 Before we know it, our high-end CAD workstation is out-of-date and in need of replacement. When you’re designing in a web browser, it opens up the list of machines available. I was so excited to finally design the bracket from SOLIDWORKS Essentials Lesson 3 and create a revision on a Linux machine. Within 20 minutes I was able to create the bracket, check it in, make a revision, check in the revision and post to Microsoft Teams with zero setup. I didn’t even have to install SQL! Reason four is one simple word: performance. There are things that are available now that weren't before, for example, there is an entire server farm waiting at your fingertips to run whatever needs to be run. Let’s take a simple example with an up and coming technology: topology optimization. 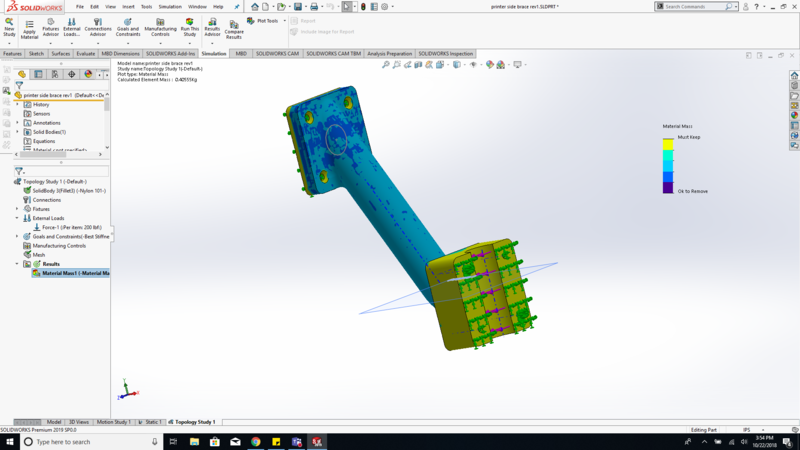 If you have questions on topology optimization, Suman Sudhakaran, a TriMech Application Engineer, wrote a terrific article explaining the concepts here. Wayne White, another Application Engineer, bought himself a 3D printer and needed to design a bracket to hold the printer on his workbench. 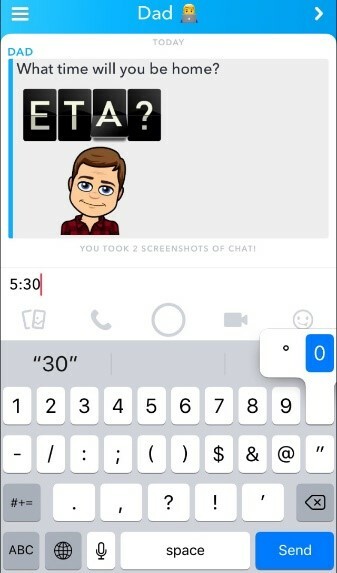 He sent the design to our team and we worked on it. 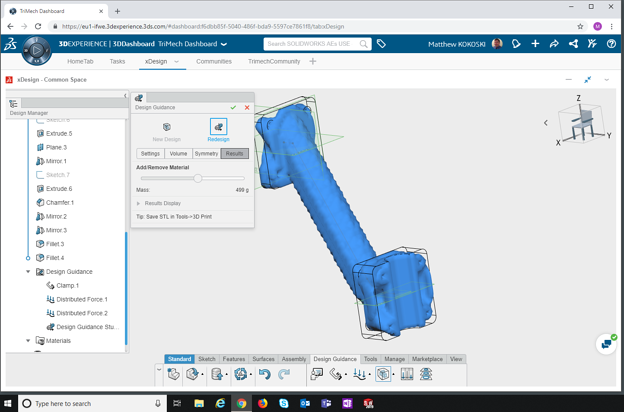 We first ran the designs in SOLIDWORKS Simulation Professional, using Topology Optimization and then I ran the designs in xDesign using design guidance. Wayne has a Precision Workstation, i7 processor, 16 GB of RAM and a high-end NVIDIA graphics card. The entire study took him 17 minutes and 30 seconds to solve, meanwhile with design guidance, I was able to run the same study in only 1 minute and 50 seconds, a drastic difference! What is even more exciting with regards to performance is that I ran it on my Dell desktop with an i3 processor, 8 Gb of RAM and an onboard Intel graphics card. Not only does this open up the possibility of running high-end simulations on everyday common machines but it also opens up worlds of possibilities with respect to development. The reason they can put Design Guidance in xDesign is that the computing power is now available. I can perform analyses while designing instead of after. Looking through my old demos the other day, I found the old marketing tagline SOLIDWORKS used, “Put the power of solid modeling on every engineer's desktop.” With the computing power of the cloud at our fingertips, we may not be too far off from enabling engineers to perform design analysis on every part. The fifth and final benefit I have for working in the cloud is the ability to work anywhere. I’ve been using xDesign off and on for a while now and I can say this is probably the reason I like it the most. It may seem trivial, but it has had a bigger effect than I ever thought it would. I use both a desktop and a laptop for work, I have a Linux desktop at home, and I travel quite a bit, bringing both a Kindle and an iPhone. Now, no matter where I am or what machine I'm on, I have access to my designs. Not every idea I get comes during working hours and that isn’t a roadblock and I don't have to worry about forgetting anything. 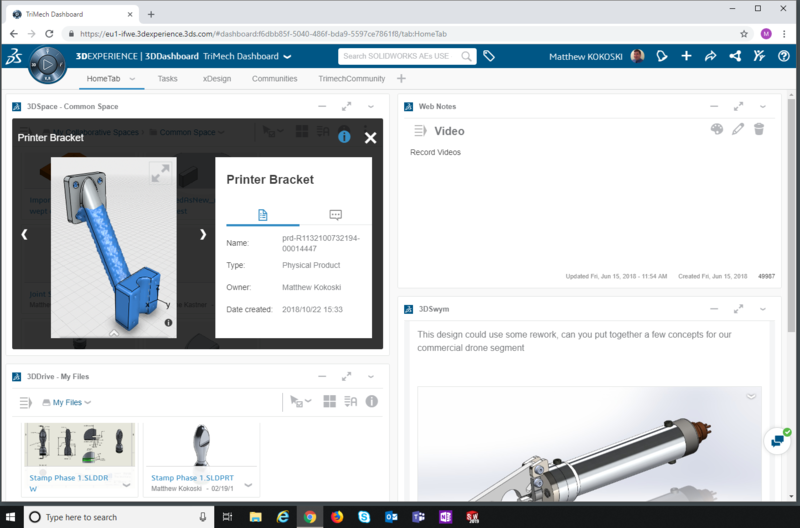 I can bring up the 3DEXPERIENCE Platform, log in and add to or edit my designs. Whether I’m at a soccer game, out playing Pokémon Go or sitting at my desk, I have access to all my design work in a 3D space in the cloud. I can just sit down anywhere and all my files are at my fingertips, without worrying about misplacing, stepping on or even sending my files through the wash on a flash drive. Hopefully these reasons resonate and give you a reason to look at designing in the cloud. For me, the switch doesn’t take much thought. We made the change to NetSuite and Office 365 long ago and I’m not sure I’d ever want to look back.